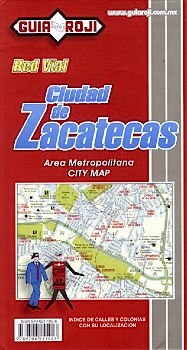 Detailed street map of the City of Zacatecas in Mexico. Shows neighborhoods, airports, public buildings, hospitals, department stores, markets, churches, archeological sites, points of interest, museums, libraries, fountains, monuments, universities and secondary schools, zoos, golf courses, sports arenas, parks, and state and municipal boundaries. Scale 1:17,000. Included are indexes of streets and neighborhoods. Also included are inset maps of Central Zacatecas City (scale 1:8,500) and Central Guadalupe (scale 1:10,000). In Spanish.